Valentine’s Day is synonym of the celebration of Love all around the world. Italy is no exception, and we would love to celebrate with you with our special Valentine’s Day pizza. How is the Valentine’s Day pizza different than any other pizza you would eat at Ambrogio15? You are right, indeed, as the common ingredient throughout all Ambrogio15 pizzas is love. When you think of it, the ingredients we are using are all a labor of love. From the San Marzano tomatoes, the Mozzarella Fiordilatte, the meats we serve you are made with love in Italy. The Petra Flour that you will in all our pizza doughs is also made with love using small batches. The cheeses are aged and monitored throughout the process by artisans who love what they do. Now let’s look at the wines, all the wines we serve are biodynamic… it’s not the easy route to take, it takes love and passion to maintain biodynamic vineyards and make sure that all the steps are followed. Our Chef Daniele Piazza is also passionate about what he does, and loves creating new recipes for you to enjoy. Now, our three owners: Giacomo, Luca and Andrea devote all their time to Ambrogio15 for the love of gourmet food and getting you to experience all the flavors Milan and the rest of Italy have to offer. So, we now have seen that there is love throughout the process of creating a pizza at Ambrogio15 and this is they key ingredient behind everything we serve in our restaurants. 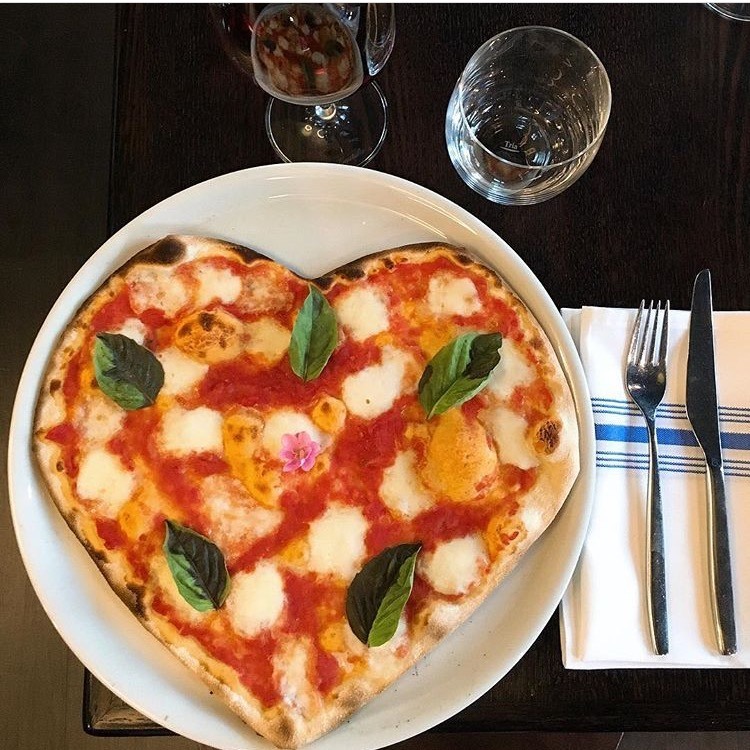 Now translate that to your table, and for Valentine’s Day, since we have opened two years ago, we celebrate it by serving heart shaped Pizza, as everyone loves Pizza and Pizza loves you back. We invite you to make reservations early for Valentine’s Day dinner as we will have a lot of demand. May you and your significant other enjoy dinner around our heart shaped pizzas and wine. P.S. : If the reservations are full, you can also get the heart shaped pizzas to be picked up and enjoyed at home from our Pacific Beach (heart shaped pizzas) and our Little Italy (round shaped pizzas) locations. We the recommend that you purchase a nice wine bottle from our friend at DOCG Imports to go with that delicious pizza. previousSan Diego Union Tribune calls it the "Best Pie in San Diego"